After my previous post on Banyuls to welcome Spring season and in the mean time Easter, here is a post about a rather underrated sparkling wine from the eastern part of France, which will surely enhance your chocolate delights for Pâques. The wine in question is a slightly sweet sparkling rosé from Cerdon, a small village located in a remote mountainous area in the eastern part of France, near the Swiss border, in the département of “Ain”. Cerdon is one of the villages that constitute the appellation of Bugey, a fairly unknown wine region nestled in the foothills of the French alps, near Savoie, about 90 kms northeast-east of Lyon and about 80 kms southwest of Geneva. A high proportion of Bugey wines are white, but white, rosé, red and sparkling wines are all produced in Bugey. The aromatic white variety Altesse, locally called Roussette, produces some of the more noted wines from the area. Bugey produces various wines under the 2 major VDQS appellations: Roussette du Bugey and Vin du Bugey (VDQS: Vin Délimité de Qualité Superieure), which is itself divided in 3 Crus and other sub-appellations (also VDQS) producing different type of wines, mentioning on the label: “Vin du Bugey” followed by the name of the Cru or/and a specific grape variety and/or the type of wine (Mousseux, Pétillant). Vin du Bugey Montagnieu VDQS: specializes in Roussette-based sparkling and still white wines with a small production of red. Vin du Bugey Manicle VDQS: the birthplace of Brillat-Savarin, mainly produces Chardonnay and Jacquère based wines and a small production of red. 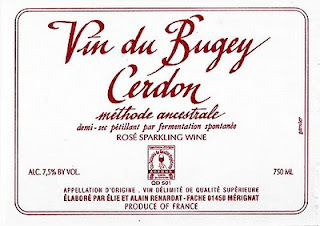 Vin du Bugey Cerdon VDQS: specializes exclusively in semi-sweet sparkling rosé made from Gamay and Poulsard. Rarely mentioned by the press and difficult to find or pinpoint on a map, this recluse and rustic, yet quaint but low-key area has still succeeded to make a name for itself over the last decade, due to the quality of its wines. Consequently, in May 2009, Vin du Bugey (or Bugey) and Roussette du Bugey received the final approval from the INAO (Institut National des Appellations d’Origine or French National Institute for the AOC), to be elevated from VDQS to AOC (Appellation d’Origine Controllée) status. A distinction that should increases the already consistent quality of the wines and should bring more attention and light to this charming area. Despite their new status, the vineyards are still hard to find and consists of about 500 hectares spread out over 67 villages in the “Ain” département, in small patches of vines planted on steep, mostly south facing slopes, scattered between cattle grazing and small farms. It is in this undiscovered region that one of the oldest sparkling French winemaking techniques is still practiced, to produce one of the flagships of the Bugey appellation: “Bugey- Cerdon Méthode Ancestrale”. The “Méthode Ancestrale” is rarely used in France nowadays, yet, in 1962, it was approved to be the only method used to produce “Vin du Bugey – Cerdon”. Bugey – Cerdon must be crafted from 100% Gamay or a blend of mostly Gamay with an addition of Poulsard, and sometime a touch of Chardonnay (depending on the producer). The method results in a lightly sparkling, medium sweet wine. It involves bottling partially fermented young wines, usually in champagne shaped bottles, before all the residual sugar has been fermented into alcohol. Therefore, the fermentation continues in the bottle and gives off carbon dioxide, which explains the presence of bubbles. The wine is designed to be sweeter and less fizzy than a champagne method sparkling wine and no dosage is allowed. 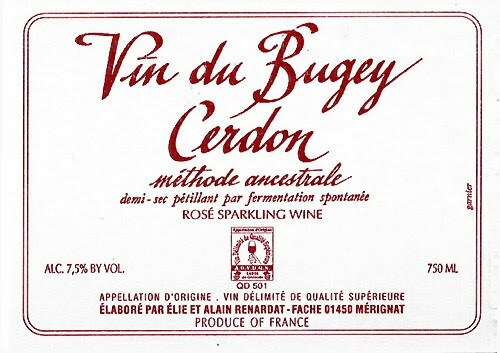 Served cold or slightly cool, Bugey – Cerdon is a refreshing and fun bubbly to be consumed within the first 1 year after bottling (almost like a sparkling Beaujolais Nouveau, but much better). Its delightful berry flavors make it the perfect apéritif! It is also highly recommended to serve it with red fruit-based and chocolate desserts. Alain Renardat is a respected vigneron in Cerdon. The Domaine is located in Merignat, a small village, 4 kms southwest of Cerdon, part of the Bugey-Cerdon appellation. Alain and his son Elie make their Cerdon from Gamay and Poulsard, and follow the "Méthode Ancestrale" (which differ totally from the widely used Méthode Champenoise, or else plain carbonation, the preferred method used for less expensive sparkling wines). The grapes are handpicked, then pressed and fermented in cold vats until the alcohol reaches about 6 degrees. After a light filtration that leaves most of the active yeast in the unfinished wine, it is bottled and continues its fermentation in the bottle, reaching about 7.5 or 8 degrees of alcohol and retaining a fair quantity of its original sugar. It is more “vinous” (or “Vineux” in French, meaning that the resulting wine still possess freshly crushed grapey primary aromas) than most Champagne, since there is neither dosage nor addition of yeast before the “second” fermentation in the bottle. NV Renardat-Fache Vin du Bugey Cerdon Méthode Ancestrale is a great semi-sweet sparkling wine to enjoy at anytime. The color is light, festive pinkish red, with gentle bubbles. The nose is a bowl of freshly crushed red berries aromas intermingled with earthy, mineral and floral hints. The palate is soft, well rounded and well balanced, neither too sweet, neither too dry, just right in the middle, with a note of residual sugar in the finish. Really approachable, juicy and easy going. Spring and Summery, its effervescence will enhance any strawberry, cherry and raspberry desserts and sorbets, as well as chocolate.